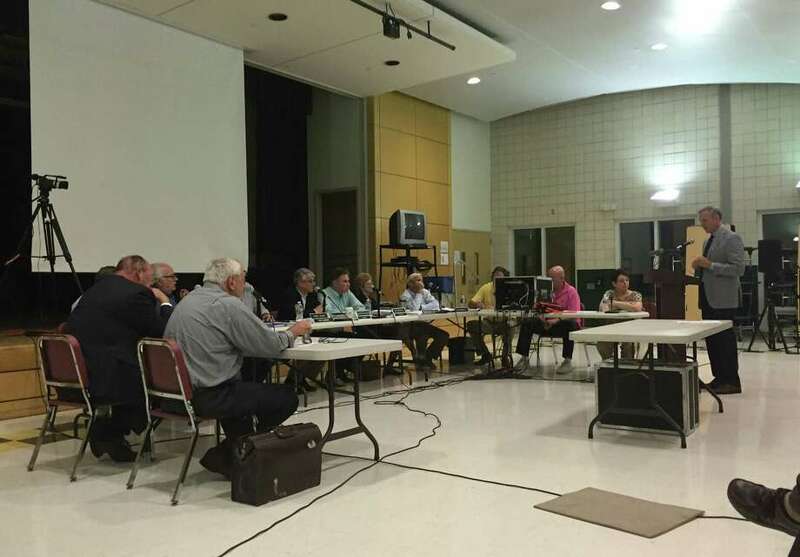 FAIRFIELD — Stratfield Road residents expressed a mix of support and opposition to a proposed assisted-living facility in the neighborhood on Tuesday night. A number of those in support of the facility said it would allow them to stay in the neighborhood as they get older. Meanwhile, those against the plan lamented parking and traffic concerns and the three-story height of the proposed construction. Sunrise Senior Living is the contract purchaser of two Stratfield Road properties, Congregation Ahavath Achim and a next-door residential property. The company’s proposal is for a three-story facility with assisted-living and memory-care units. This week’s public hearing had been continued from the previous Tuesday, when one Stratfield Road resident claimed developers had tried to play racial biases and, at one point, a commissioner left the room. This week, Mark Fishman, a 36-year resident of the neighborhood, said he hopes the facility is approved and in the future, he and his wife would like to have a way to stay in the Stratfield area. Fishman called the proposed project an aesthetic upgrade from the current building. A few congregation members of Ahavath Achim spoke about their hopes for the plan to benefit the neighborhood. The synagogue’s president, Barbara Tuckel, also speaking as neighborhood resident of Golf View Terrace, said she sees the Sunrise facility as a needed enhancement for the community and its growing senior population that hopes to stay nearby. The congregation is “not abandoning the neighborhood. We love the neighborhood very, very much,” she said. Others expressed concern. Linda Vaughan, of Argonne Street, said the residential neighborhood is not in transition now, but the assisted-living building would set a precedent and spark the area to become less residential. James McCusker, a Lola Street resident, critiqued what Sunrise would bring to the Stratfield community, given the effect he believes the facility will have on the neighborhood’s look and value. After public comment closed, Sunrise was allowed a chance for rebuttal. Senior Vice President of Real Estate Philip Kroskin said the company would want to avoid noise complaints during construction, and the proposed ratio of parking spots to units is higher than at most other Sunrise facilities. On the few times a year when the lot would be busier, he said Sunrise would shuttle employees and visitors from other lots. In response to a question from the commission later in the rebuttal, Kroskin clarified that building a two-story, assisted-living facility would be economically infeasible on the property. Public comment wrapped up Tuesday night, but the commission continued the hearing to allow Sunrise to submit a rendering of the proposed facility from an on-the-ground perspective — possibly with additional options showing more plantings in the front of the facility — at the suggestion of a commission member. Wagner clarified the options would involve minor landscaping adjustments, and there will be no additional meetings for the public hearing.